You are here: Home / Reviews / Food / Spring Entertaining Made Easy and Delicious! Want to enjoy more time with your family and friends when entertaining this spring? Take a yummy short cut when it comes to dessert for spring entertaining made easy—and delicious!! Being a food blogger and recipe creator, I obviously love being in the kitchen. However, I’ve mentioned before that during holidays and when entertaining, I want to be in the kitchen less and with loved ones more. I’m sure you can relate. While I’ll still make a full spread for Easter dinner, because for me, that’s a tradition that I’ve kept going for my family, I won’t be making dessert. 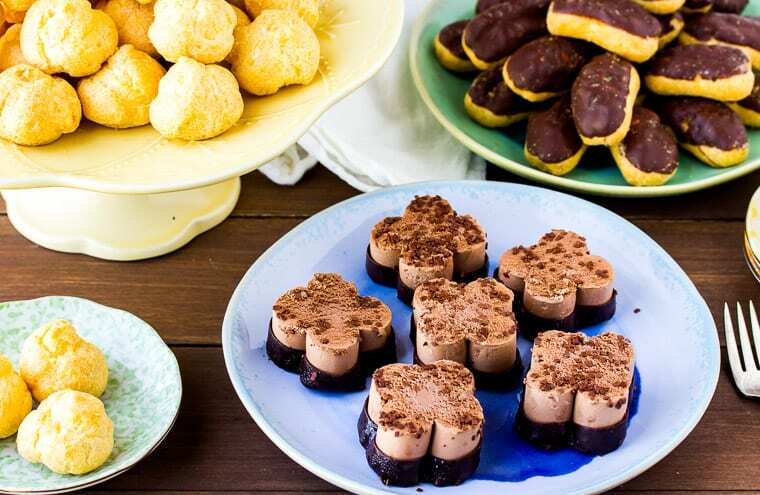 For dessert, I’m putting on a fresh pot of coffee and serving up a variety of Delizza frozen desserts—including Belgian Mini Cream Puffs, Mini Chocolate Mousse, and Belgian Custard Cream Mini Eclairs. So, while I am not making dessert, I am still serving dessert. I think my family would disown me if I didn’t put something sweet and delicious out after dinner! Friends, I’m here to tell you that it’s okay to take some short cuts. Especially if those short cuts don’t mean lower quality. Freeing up more time by not making dessert gives me so much more high quality time with my family, especially my kids who are growing up way too fast. 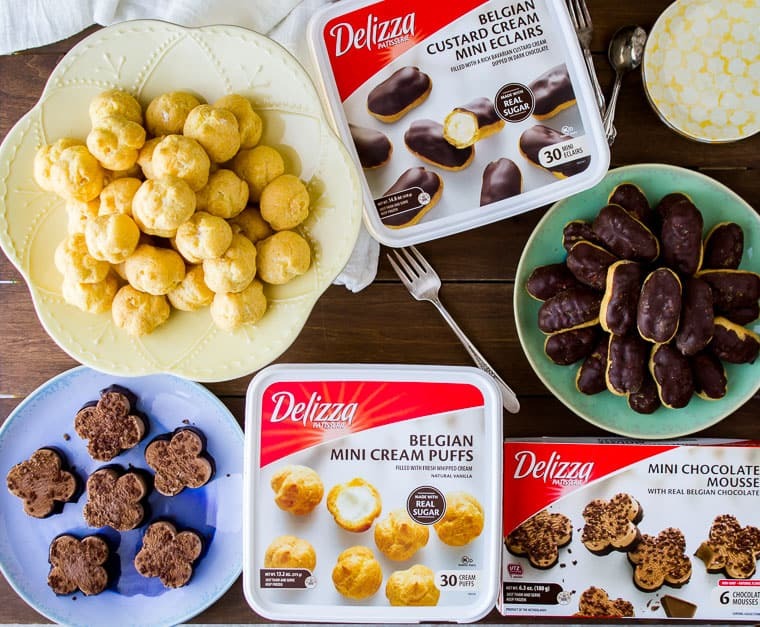 Delizza frozen desserts only take about 30 minutes to thaw at room temperature. Trust me, these desserts are so good, no one is going to be complaining that mom didn’t make them! And, it only takes a little time to make these mini desserts look even more special and festive to keep it fun. 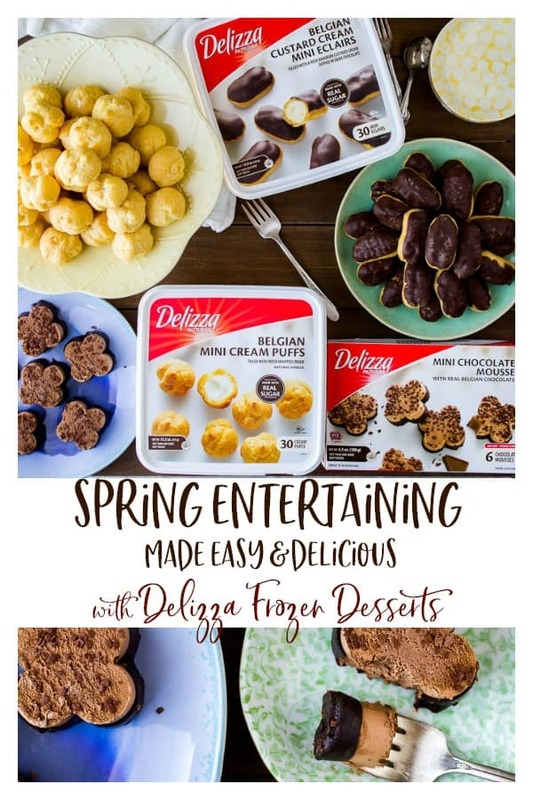 Delizza frozen desserts are great to serve for brunch or at any spring event such as bridal showers, garden parties, or birthdays. I actually really love displaying mini desserts. It’s so much easier to fit in a variety of dessert options, and you can easily mix up the colors of the plates and stands to suit any occasion. I use a mix of pastel colors for spring entertaining. Cake stands and pretty plates are great ways to stack mini desserts in a variety of patterns. Your guests will be so tempted to put one of each on their small dessert plates! Set out a few dessert forks, for those who might not want to eat with their hands, and a stack of napkins. Then, sit back and relax! Who doesn’t love cream puffs? 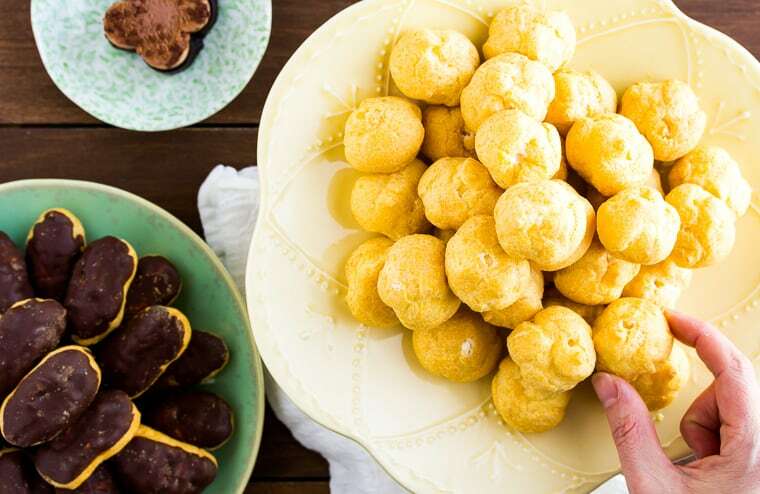 These Delizza Belgian Mini Cream Puffs are the cutest, most delicious 2-bite treats! These mini cream puffs are now made with real sugar (rather than high fructose corn syrup) and filled with fresh whipped cream. 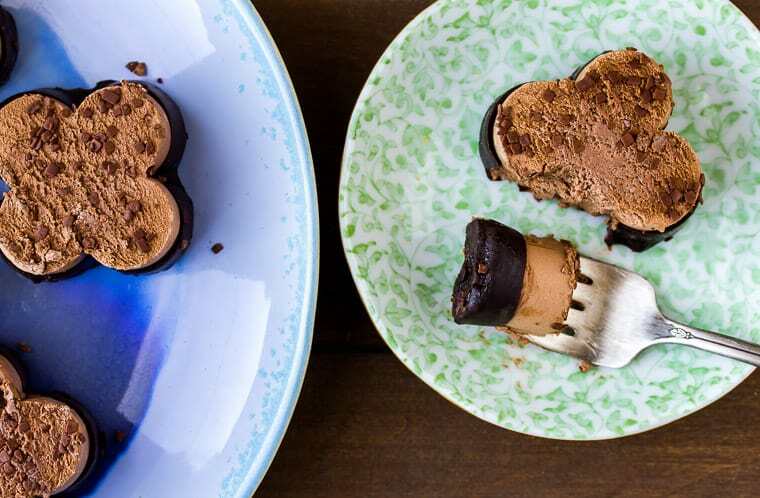 This chocolate mousse is made with Belgian chocolate and most definitely a perfect option if you’ll be entertaining any chocolate lovers this season. I especially love how they are shaped kind of like chocolate spring flowers. Just perfect! 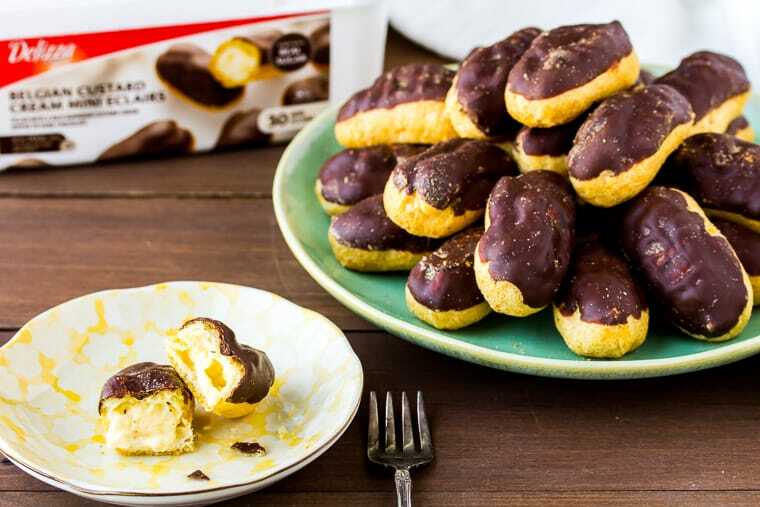 The first Delizza frozen dessert that I had ever had was the Belgian Custard Cream Mini Eclairs. When I was really young, I can remember my great-aunt bringing over some bakery-fresh eclairs and how I would ask for them constantly after that. I was so excited when I first found these Delizza eclairs at the grocery store. I am not kidding when I tell you that these mini eclairs remind me exactly of the ones I loved so much from my childhood! They are filled with a rich Bavarian cream and topped with decadent dark chocolate. This recipe has also been improved to now use real sugar instead of high fructose corn syrup. 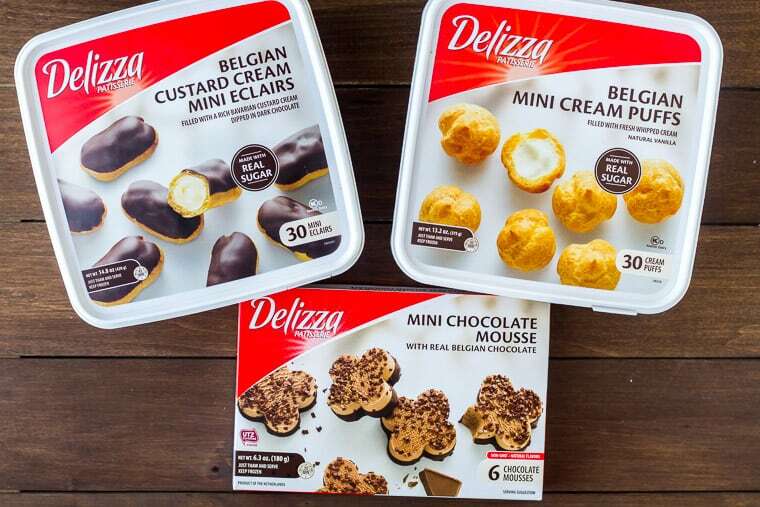 You can use the store locator on the Delizza website to find these delicious desserts at a store near you! Enjoy this post on Spring Entertaining Made Easy? Follow me on Pinterest, Instagram, and Facebook for more!